"I want your drama, the touch of your hand..."
There's something about putting on a perfect dress that has either been made for you, or at least feels as if it has. It can feel like somehow, this dress knows who you are; what you want to accentuate and what you want to hide, dress and wearer both bringing out the best in the other. The perfect dress can be a silent exclamation of self, helping you tell the world, "This is me, at my best." P.T. 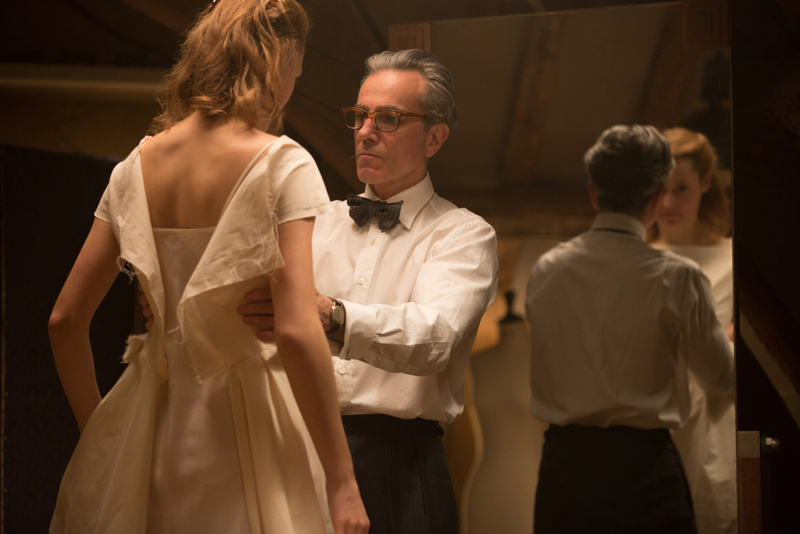 Anderson's Phantom Thread, centered on mid-1950's haute couture dress designer Reynolds Woodcock (Daniel Day Lewis), is also an odd romance. Woodcock, along with his sister Cyril (Lesley Manville, manicured perfection), runs the House of Woodcock from the same multi-storied, London building they both call home. Their clients include royalty and socialites, and Reynolds lives a rigid life that allows for a live-in muse, though not marriage. As the film begins, he sits down to breakfast with his sister and the latest in what is clearly a long line of women who he keeps around as long as they provide some kind of amusement and inspiration. Once they become annoying, he is through with them. "Is there nothing I can say to draw your attention back on me?" his latest muse asks. There isn't, and it doesn't take long before Reynolds has moved on to another muse, instantly infatuated with the slightly gawky and endearingly clumsy waitress at a hotel near his country home. Alma (Vicky Krieps), a German immigrant at least half Woodcock's age, appears to be the perfect muse for Reynolds, eager, open, and with the perfect shape. (Sister Cyril can't resist telling Alma "he likes a bit of a belly," as she records Alma's measurements at the end of Alma and Reynolds's first date). Being fitted for a dress, and being praised for perfect proportions, ("It's my job to give you breasts," says Reynolds, after Alma apologizes for her small size), is a form of seduction Reynolds has likely used before, and Alma is not immune. But Alma shows some steadfastness from the beginning, never letting him get the last word he so desperately seeks in almost every conversation. She questions his aesthetic, and challenges his rigidity. It's clear Alma will not be discarded so easily. "I want your horror, I want your design..."
I've seen Phantom Thread twice now. I initially went into it with perhaps too much enthusiasm directed at the wrong thing. Combining one of my favorite filmmakers with a story centered on my favorite period of fashion (almost every dress I own is older than I am by decades), seemed like something too good to be true. I was expecting too much from the fashion in the film, which, while beautiful, is nothing that would have made it into the history books. Upon second viewing, I realized that's kind of the point. Anderson and costume designer Mark Bridges did a lot of research, and were influenced by the work and lives of couturiers Balenciaga, Dior, and Charles James. But they didn't choose to just copy some of their most elaborate gowns. What Reynolds Woodcock creates is beautiful, but in many ways as staid and stiff as he is. Near the end of the movie he goes on a rant after hearing a longtime client has begun to shop at a different house, searching for something new and "chic." He screams about how much he detests that little word, chic. Reynolds has singular vision, but he's been at it for years, and he doesn't seem too interested in innovation. Once I got past obsessing about the clothes, I was better able to appreciate the intricacies of the story and the very, very, weird and Gothic romance at the center of it. Reynolds, like many a self-centered man, has major mother issues. He designed the dress for his mother's second wedding, and he is forever haunted by her, designing for her approval, which will never again come. A romance with someone like that might seem doomed from the beginning, but Alma's solution drives the film firmly into the realm of sublime dark comedy. The film is not only about a romance, but is itself deeply romantic. Johnny Greenwood's classical and ever-present score is lush and almost a character unto itself; I can't imagine the movie succeeding without it, so integral is the mood it sets. 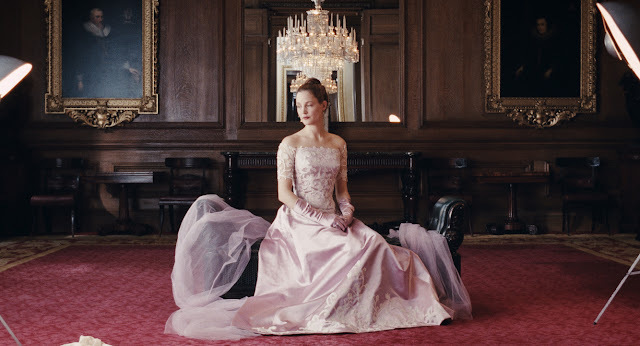 Anderson was his own cinematographer, and photographs the film so that it frequently seems to take place on an overcast day, with muted light that allows its jewel-toned fashions to pop off the screen. (See it projected in 70mm if you can). Daniel Day Lewis has famously said this will be his last acting role. Whether that's true or not, it's interesting to see him attempt to leave on a note of subtlety. This is not like many of the bombastic roles he's played in the past, but it is no less impressive. The way he is able to convey utter annoyance and contempt by merely flexing his jaw and turning his head illustrates more than screaming ever could. His scenes with Vicky Krieps have a magical frisson, and it's fitting that a relative unknown should be cast against him. It's easy to assume she might wilt opposite someone like Daniel Day Lewis, but like Alma, Krieps doesn't do the expected in any of her scenes with him. In one of those scenes, an epic battle over a home cooked meal, its clear much of their dialogue is improvised, which gives the whole argument the sting of painful reality.